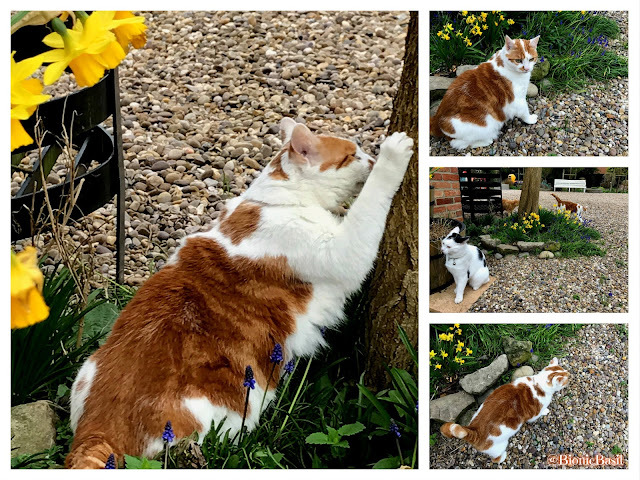 So how purretty are them flowers, I just love this time of year, the little splashes of colour popping up really make me smile. Anyhoo, the new recruits have been put through some other tests and Pandora, well Pandora was not furry compliant with this one. Basil decided to take full advantage of the mini-digger that is still on site, as obviously we can't get anything out of the bunker yet, and thats if the hatch opens once the new turf is laid. So aftur a few minutes of playing in said digger, Basil said. "Come on Pandora, it's your turn!" Pandora replied, "Mew don't seriously think that I'm going to be driving that?" "Jeez MRS, like what's the purroblem?" Basil asked. "Most kitty commando's would love to drive this!" "This equipment is not standard spy issue," Pandora said in her clipped accent. "I vas 'oping fur more of a stealth bomber or something!" Basil looked at her and tutted rather loudly. "Pandora, mew're part of the B Team now and we don't have a stealth bomber in the bunker, we don't even have a runway in fact, so it's the digger or nothing today!" She looked at him, harrumphed and said. "I vant to be alone!" and promptly vanished. Basil stared at the now vacant space occupied only seconds ago by Pandora and said. "Somedays mew just can't get the staff!!!!!" Mew maybe wundering what the pendant is around Basil's neck, that is part of his homeopathic treatment package, it is programmed specifically fur Basil and his needs right now to help heal and strengthen his body aftur the second attack of pancreatitis. And I think mew'll agree with me when I say doesn't he look so much better this week? He almost looks like his old self, so paws crossed that his treatment continues to wurk, we'll keep mew updated as we progress with it. Susan Becker keeps finding herself mixed up in mysteries when she should be busy cooking up something sweet in her bakery in the small tourist town of Lakeside, Missouri. Her best feline friend, Mr. Giles, is one of those curious cats who can't keep away from a fresh crime scene. Detective Kip Fletcher has the unpleasant job of finding out who dug up and stole the corpse of one of the town's leading citizens. Mr. Giles already knows the truth. But can he guide Susan and Kip to the body snatchers before they vanish along with the corpse? 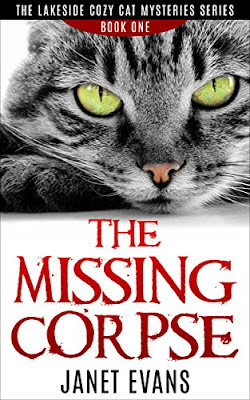 This one is new fur me, a compact cozy mystery. This tail, sorry tale was only 2 hours long but even though it was bite-sized it was still a really good story. 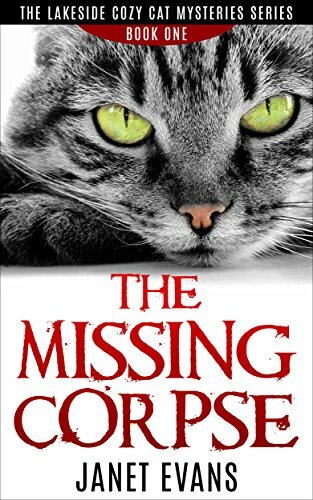 So if mew want a quick read, this is definitely the cozy mystery fur mew, absolutely purrfect fur a rainy Sunday afturnoon when mew want something light and easy to read or listen too! I hope mew enjoy this book if mew do take the plunge and buy it... and if mew've read it already, tell me what did mew think? Sadly it's time fur me to say BFN or bye-fur-now as mew know the drill, so many books, so little time and we'll be here again on Friday. That pendant thing sounds really interesting, and how cool it is helping Basil! Yes, Basil is looking good! That sounds like a great book, too. Sometimes shorter stories are perfect reading when you want to just sit down and finish a book in one sitting. We're so glad Basil be lookin' and feelin' better. We're sendin' hugs and purrayers. I am happy to see Basil looking so good. That is a neat little necklace. Great review Amber, this sounds like a good story. Basil you look terrific....that magical homeopathic pendant must be doing the trick pal. Amber, thanks for another great book review! Great to see the big B looking so well! That pendant seems just the thing... does it have any other properties too? Anyways we've never seen such a short story, but it sure sounds like a great one for short journeys. 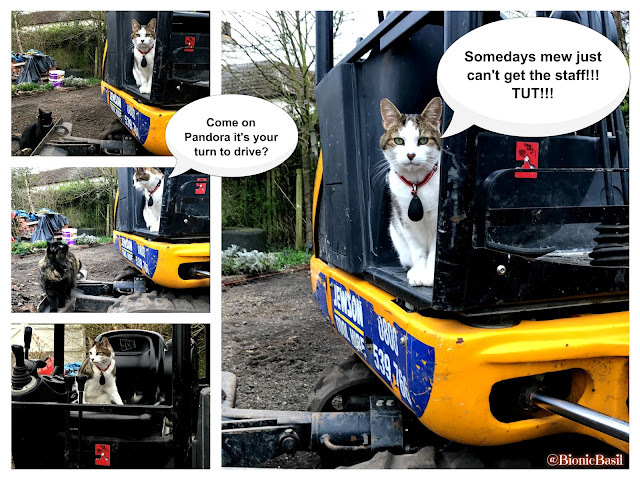 As to Pandora, I reckon there would loads of cats that give their spare mouses to fun it up in a mechanical digger! I know I would! We would love to drive a digger. Then we would be outclassing dog-guy the terrieristic digger-dog! We are glad that pendant is helping. Pawppy had weight loos drops that were 'tuned' to his frequency and he had to take then 3 times a day...and he had to re-resonate them on his palm each time. And over the course of about 18 months he lost over 150 pounds. Petcretary often uses homeopathic remedies. Under the tongue they go!